Figure 5 Projection of the cusp manifold onto the control plane. The shaded region on the plane corresponds to negative surfaces of the manifold, and are unstable states of the system. Any system entering this region becomes unstable and will transition rapidly to a new stable state. Figure 6 Light caustics reflecting off the bottom of the swimming pool at Filoli Gardens, California. together at the cusp. Any system or process entering the region of transition will move rapidly from one state to the other upon exiting the region. The projection or mapping of smooth surfaces onto spaces of lower dimension is a practical feature of singularity theory, and many examples may be found in nature. 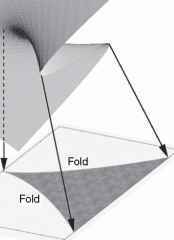 For example, apparent singularities are encountered when folded three-dimensional surfaces are projected onto the human retina. Perhaps the most robust applications of 'catastrophe theory' have been in the field of optics, where caustics, or the apparent concentration of light into bundles, are explained as the mapping or projection of families of light rays, defined by catastrophe manifolds, onto sensitive or reflective surfaces. 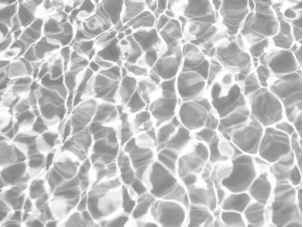 One classic example is the appearance of light caustics in water, seen for example as reflections off the surface of the ocean, or off the bottom of a swimming pool (Figure 6). Apparent singularities in the reflections, such as the crossing of lines, or three-way branching points, are seen upon closer examination to be the familiar fold and cusp catastrophes. 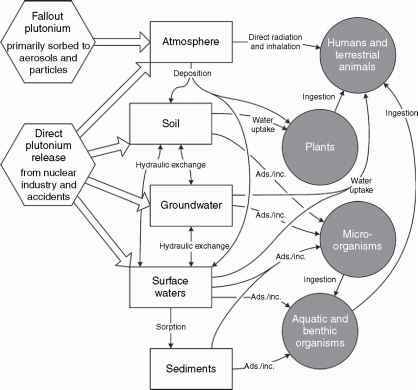 Also apparent are catastrophes of co-dimension greater than two, since multiple parameters, reflective and refractive events, may intervene before final reflection of the original incident rays onto a sensitive receptor. This suggests the existence of manifolds more complex than the fold and cusp catastrophe manifolds. reversible trajectories on the fold morphology (Figure 4) or its mapping onto the control plane (Figure 5). Third, neighboring system states that are initially indistinguishable (i.e., the manifold is relatively flat on local scales) may diverge as they follow trajectories into the neighborhoods of cusps and folds. Thom's list has since been extended for up to 5 input parameters, yielding a total of 11 catastrophe manifolds. The central point of the theorem, though, is that the manifolds are not arbitrary descriptors of the behavior of systems with r inputs and n outputs; they are in fact the canonical descriptors of such systems, and are expected to explain the presence of discontinuities in those systems. It is therefore reasonable to expect that these manifolds may serve as explanations for the existence of, and transition between, alternative stable states in multiparameter ecological systems.